It must be many people’s dream to be stranded on a desert island but what would it be like if it became reality? It would not take long for the dream to turn into a nightmare especially if you had to share the island with six strangers and very few provisions. This is what happens in Stranded, Emily Barr’s latest novel, which is a fabulous read from start to finish. It is tense and thrilling and the sort of book that keeps you guessing all the way through. In Stranded, Esther has escaped to Malaysia to get over the end of her marriage. She is heading for the Perhentian Islands which she hopes will be as idyllic as it has been described to her and a place to refresh and clear her mind. Although she is travelling alone, most people are very friendly, especially Katy, another lone traveller. They decide, along with five others to take a boat trip to a remote island, but when Samad, their guide fails to return, they realise they are stranded. As days pass and there seems little hope of rescue, they have no alternative but to fend for themselves. As far at they no, there is no hope of rescue and they will have to spend the rest of their days on the island speculating about what may have happened to them. It’s all very sinister though and if they are ever to be rescued, what will happen then? 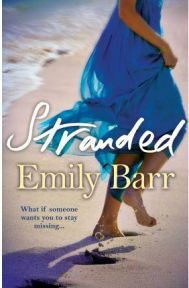 I think that Stranded is a brilliant book and is definitely Emily Barr at her best. The story builds gradually but in such a clever way that you have to keep reading more. I did wonder, when the seven characters were stranded on the island, where the story could go in the remaining 300 pages and I was a bit worried that it might be a bit slow. I needn’t have been concerned though, as there were some thrilling turns of events that kept me on the edge of my seat and there was definitely at least one shock that I didn’t see coming. Stranded‘ is written in the first person and is told from Esther’s point of view. This works very well as it means that the reader only sees and knows what she does. Therefore, we are as mystified as she is when Samad fails to return to the island, and we tend to trust the same people as she does. We also only know details about the others that they choose to share with Esther. Also, as she is telling the story, the reader is able to share her despair especially at being parted from her daughter, Daisy, with no way of knowing what she is thinking. I really enjoyed reading Stranded. It’s absorbing; it’s surprising and it is very cleverly written. It’s a must for all Emily Barr fans and would be a great introduction for anyone not yet familiar with this fabulous author.